Scott began his career in public accounting in December of 2009 and became a partner in the firm in 2016. In December 2017, the firm was renamed Enderle & Romans, PLLC and moved to our current offices on Main Street. In additional to being a CPA, Scott holds an ABV (Accredited in Business Valuation) and CFF (Certified in Financial Forensics) credentials from the American Institute of Certified Public Accountant and the CFE (Certified Fraud Examiner) from the Association of Certified Fraud Examiners. 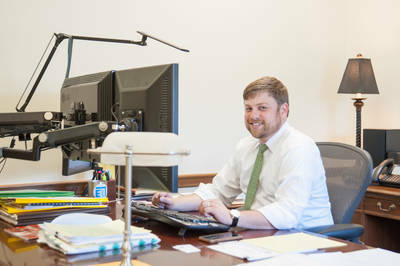 Scott works primarily with closely-held businesses and their owners with complex tax planning and tax compliance. Scott works with a variety of entities, including professional services (attorneys, engineers, and other consultants), construction, real estate, healthcare (physician and dental owned practices), transportation, and oil & gas. Scott also works with businesses on a broad range of consulting services, including temporary controllership services, sales and purchases of businesses, new business setup, and business succession planning. Scott has served as an expert consultant as well as assisted in the preparation of expert witness testimony on numerous cases involving allegations of fraud. He has assisted attorneys and business owners with discovery, damage calculations, and fraud investigations. Scott has also performed numerous business valuations for business succession planning, trust administration, and in the litigation setting. In November 2017, Scott was one of 20 CPAs honored by the American Institute of Certified Public Accountants with a Forensic and Valuation Services Standing Ovation for exemplary professional achievement.